As for all of Satan’s nonsense, remember that you should maintain an attitude of denial at all times. This is a principle. Why is that? Someone says, “You think that Satan’s words will never be consistent with the facts. Isn’t it stereotyping Satan?” It is not stereotyping; it is a conclusion derived from Satan’s nature. Satan’s words are always adulterated, they always contain its ulterior motives. When Satan speaks of them, things become distorted beyond recognition. What Satan says is just the opposite of fact. It distorts the facts and turns black into white. It creates rumors and fabricates things out of nothing; it pins nonexistent things on you. This is one scenario of how Satan speaks. Satan has told lies from the very beginning, and there are several kinds. The first kind is a lie that is an utter fabrication; it’s something that simply doesn’t exist, but is pinned on you from hearsay. Another kind of lie comes from embellishment, and once something has been embellished it’s not in line with the facts, either. There is still another kind of lie that is a distortion of fact, inversion of black and white that turns right into wrong and wrong into right. These are the three primary kinds of lies; they are very common. Satan says, “Believers in Almighty God often abduct people when they spread the gospel.” Isn’t this a distortion of fact? (It is.) Satan also says, “For those who don’t accept, believers in Almighty God will cut off their ears and noses and gouge their eyes out.” We’ve preached the gospel to so many people; what is the proportion of those who have accepted it? If all those who do not accept had their eyes gouged out, their noses and ears cut off, how many of them would have been cut off altogether? Who has ever seen even one such case? So, everything Satan says is a lie and is nonsense. Satan has also said that The Church of Almighty God was created by the man used by the Holy Spirit—isn’t that nonsense? Had it not been for the appearance and work of Almighty God, who could have created The Church of Almighty God? Do church members believe in the man used by the Holy Spirit or do they believe in God? They believe in Almighty God, not the man used by the Holy Spirit. Since the man used by the Holy Spirit is not the one they believe in, why did the Chinese Communist Party say that The Church of Almighty God was created by the man used by the Holy Spirit? Wasn’t it a bold-faced lie? The CCP also said that “Eastern Lightning” is a cult. Are they arbiters of the truth? Are they religious experts, professional appraisers? Do they understand religion? Do they have any true faith? Do they have any qualifications to determine which religions are cultish and which are orthodox? The CCP is the world’s largest cult: Satanism. Are they qualified to determine which denominations are orthodox or cultish? Who appointed the CCP as the judge and appraiser of religions? They have the nerve to pass judgment so casually—this is called utter shamelessness. Satan even said: “Almighty God is a woman in Henan.” This is nonsense. Christ was clearly born in a city in northwest China. Henan is in the central plains. Satan saying that Christ was born in Henan is a bold-faced lie! It is a rumor invented by Satan. Isn’t it sheer nonsense? (It is.) So how should people regard these rumors fabricated by the CCP? You have to look at its history. The CCP has never spoken a true word. Not only has it never spoken a true word to the Chinese people, but it has never told the truth to the world. What is the Communist Party? The Communist Party was created by Karl Marx. Where did Karl Marx come from? Karl Marx was a believer of Satanism. He claimed that he was the savior who wanted to save mankind, so he wrote the Communist Manifesto and Capitalism. He wanted to use force and violence to seize political power and then control the whole of mankind. This is the truth. Has the Communist Party said these things? Have they announced this to the world? They have never uttered any truth, not a single word. Has the Communist Party said anything about the terrible things they’ve done? What is their ultimate goal? Have they said anything about it? Not a word. Everything they say is a lie. The so-called things like “Serve the people, work for the people’s benefit,” aren’t these nothing but lies? These are all lies; not a word of it is true. Then why do you believe the words of the Communist Party? In examining the true way, examining God’s appearance and work, why do you believe the words of Satan the devil? This is a problem. When you examine the work of God, you need to examine His utterances and see if these words of God are the voice of God, if they are the truth and the work of God. Then look at whether the Holy Spirit’s work is in The Church of Almighty God. What have these people achieved after many years of faith? Do they have any knowledge of God? Have there been any changes in their life disposition? Have the toxins of Satan been cleansed? You need to examine these things. You don’t examine the words of Almighty God, don’t examine whose words God’s chosen people of The Church of Almighty God eat and drink or whose work they are experiencing—why do you go to the great red dragon and believe Satan the devil’s words? Why do you believe the words of the religious pastors and elders? What kinds of creatures are they? They are wolves disguised in sheep’s clothing; they are hypocritical antichrists; they are wicked servants; they are demons that devour human souls. Why can’t you see through into their essence? This is the greatest ignorance and foolishness of human beings. We believe in God and act according to the word of God, the truth and the requirements of God; we do not participate in politics or engage in political activities. God’s most basic requirement of His believers is to foremost pursue and practice the truth, to be the light and salt of the world, to do things that are beneficial for others, and to not follow the evil trends of the world or perform the evil acts of corrupt mankind. Another duty of ours as creatures of the Creator is to do God’s will. Since we have received salvation from God, we have the obligation and responsibility to preach the gospel and bear witness for God so that those who have yet to believe in God, who don’t know or understand God, may come before God to study the true way, accept the truth, and attain full salvation. This is God’s commission for us and it is the true meaning of our work of preaching the gospel. Our preaching the gospel to bear witness for God has nothing to do with politics. There is no political intention or motive, nor is it to overthrow any government or political party. It is entirely for the sake of bringing corrupt mankind before God to accept God’s work in the last days to attain complete salvation, so that man can finally live and work in peace and with dignity. It is so that all may break free from the influence of darkness and evil to live in the light. It is so that human societies may receive God’s care, protection and blessing. We bring people before God to accept God’s work and salvation. It is not a political appeal. There is absolutely nothing in God’s word about having His chosen people rise up and overthrow the Communist Party. Everything expressed by God is the truth and it all exposes the essence of human corruption. It is all for saving people, changing people, and making people perfect so that they may know and obey God. Everything we do is based on the word of God and according to the requirements of God. Our church has never engaged in any political activities, nor do we have any political slogans. Our church life is just to communicate the truth and know ourselves in order to obtain the truth, obey God, and live out a true human likeness, and attain full salvation from God. We have absolutely no interest in politics, which is not a positive thing and is particularly not the truth. Engagement in politics does not lead to receiving the truth, let alone the blessing of God. Throughout history, God appraising any politician is unheard of. The pursuit of politics cannot bring salvation to man. Getting entangled in officialdom can only make people increasingly corrupt and evil—this is patently obvious. This is why those of us who believe in God never participate in politics and we particularly don’t have any political aspirations. This is because we have seen very clearly that only by believing in God can we become better and better, and possess more and more humanity, conscience and sense. If man can sincerely believe in God and pursue the truth, he can certainly live out the likeness of a true human and satisfy the criteria for attaining full salvation. Our evangelical efforts are entirely to have mankind accept the work of God and be fully saved. This is the most beneficial thing for human society, and it is the only effective way to change the darkness and evil of human society. Because God is the Creator, He alone can save corrupt mankind. Our preaching the gospel and bearing witness for God is so that humanity as a whole may know the Creator, come before Him and worship the one true God. This is mankind’s path to obtaining blessings, and particularly the path to complete salvation. Only by believing in God and accepting God’s salvation can the fundamental issues of darkness and evil in the world be resolved. As the world is becoming increasingly dark and evil, humanity increasingly corrupt, human morality increasingly depraved and degenerate, in order to resolve these issues mankind must believe in God, accept God’s word and work, and accept God’s judgment and chastisement to gain the truth from God’s word. This is the only way the problem of man’s corruption can be resolved from its roots. Hence, for social stability and happiness of mankind, preaching the gospel is indispensable and is the only path. If mankind wishes to attain true happiness and have society attain long-term stability and order, there is only one way, and that is accepting God’s work and salvation. There is no other way but this. Don’t expect any countries or political parties to save mankind, let alone any politicians, writers or thinkers to do it. Corrupt mankind doesn’t have such ability. No one can reverse the current course of events. Only the Creator, the one true God, is fully equipped to save humanity. So, our preaching of the gospel is most advantageous for the stability of society and the happiness of mankind. It is the most meaningful thing. I believe that those who possess conscience, reason and a sense of justice will support us in preaching the gospel and will agree with our view. Preaching the gospel and bearing witness for God is what mankind and society need. It is entirely a just cause. It’s because we came to understand the truth by accepting Almighty God’s word and experiencing His judgment and chastisement that we began to preach the gospel and bear witness to God’s work in the last days. As believers, it is our duty to have corrupt mankind come before God to receive His salvation. We preach the gospel to deliver the true path of attaining complete salvation to man, enabling man to accept the true way and be fully saved by God in the last days. This is our truest love. Witnessing to people about the good news that can enable mankind to survive the disaster and attain full salvation is truly a good deed that is recognized by mankind. The kingdom gospel of the last days that we preach is greatly beneficial for man. As the ruling party, whether it is legitimate or not, the CCP should do some practical things for the people and solve some practical problems. Allowing the people to live and work in stability and peace is just and right. Why does the Chinese Communist Party neglect its duties, instead ruthlessly coercing, arresting and persecuting us? Isn’t this going against Heaven and running counter to right principles? Why doesn’t the CCP conform to the wills of Heaven and the people but instead adulates evil and resists justice? Isn’t it devoid of humanity? In the process of preaching the gospel and performing their duty, many of God’s chosen people have been able to put aside physical comfort and enjoyment to persist in preaching God’s kingdom gospel of the last days amid rain and storms, heat and cold. Even when vilified, maligned, rejected, beaten and abused, and even when hunted and persecuted by the CCP government, God’s chosen people have still persistently, indefatigably fulfilled their duties to spread the gospel and have performed to their utmost. Regardless of others’ acceptance or denial, we must be dedicated to our duty and love. If we know the true way but do not proclaim it and bear witness to others, our consciences could not be at rest, and that would not be fair to other people. Therefore, what we do is to preach the gospel and bear witness for God to inform people of the true way and the path to attain full salvation in the last days. This is the duty we should perform. By preaching the gospel and performing our duties we are not participating in politics, and we particularly aren’t disrupting societal order. Rather, we are preparing good deeds and it is entirely so that others may live happily and with dignity. This is a fact. There is a principle of truth that can be sought on how to differentiate between a cult, an evil belief and an orthodox, proper belief. It would not be fair to go by the views of any political parties or individuals, or the opinions of any countries or constitutions. First, we must determine what is orthodox and proper in order to determine the true way. Only the truth is positive and the source of all things positive. Where does the truth come from then? The truth comes from Christ. Christ is the embodiment of God, thus the truth comes from God. All that comes from God is positive, only the Creator’s word is the truth, and only Christ in the flesh can express the truth. It is the will and the rule of Heaven that no countries, political parties, or groups can defy, let alone resist and oppose. Whoever defies, resists or opposes Him is seeking self-destruction, which completely fulfills God’s word that corrupt mankind will seek self-destruction by resisting God. In the world and human societies, all positive things are consistent with the will of Heaven and the will of the people, and whatever conforms to the will of Heaven and the will of the people is an orthodox belief. Belief in God is one such thing. Consistency with the people’s will means the majority of mankind approves of believing in God and conscientiously affirms that having faith is following the right path. People generally believe that believers are good and decent people. Therefore believing in God, obeying God, and worshiping the Creator is just and right, and purely a positive thing. It is consistent with the wills of both Heaven and the people. Then what is evil? Evil is contrary to the will of Heaven, it is acting perversely against the wills of Heaven and the people. What kinds of things are against the wills of Heaven and the people? Disallowing people to believe in God is one. Any act that is resented and condemned by human conscience and reason is evil. Anything that is supported, recognized and approved of by mankind conscientiously and rationally is positive. Faith is a positive thing. Any act that resists, condemns or opposes God is negative, and all negative acts are the doing of Satan’s evil forces. If we can determine what is positive and what is evil, it will then be easy to differentiate an orthodox belief from a cult. After all, what is an orthodox belief and what is a cult? To be exact, all churches that believe in the true God are orthodox, while any that believe in false gods, evil spirits, and the devil Satan are cults. Any that agitate for God-resisting heresies and fallacies such as atheism and evolution are cults. Now let’s examine the origin of the Communist Party. As we all know, the Communist Party was founded by the German Karl Marx. Marx was a believer of Satan, a Satanist who claimed that he himself was the devil Satan. How could the Communist Party, founded by such an authentic devil, be a proper institution? The Communist Party has consistently advocated violent revolution; it is a slaughterer of human beings and a genuine atheist entity. In the Communist Manifesto, Marx stated, “A spectre is haunting Europe—the spectre of communism.” Now that this spectre of communism has materialized in the Chinese Communist Party, can’t we see that this reactionary Communist Party is an authentic cult? 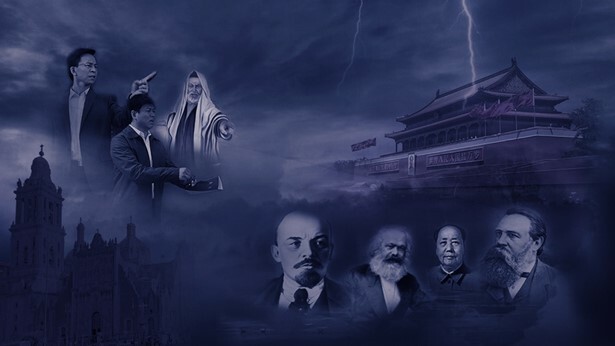 The Chinese Communist Party is more cunning than its forefather Karl Marx, who dared to openly admit that he was the devil Satan, but the CCP does not dare to say so. The CCP is adept at distorting facts, turning black and white on its head, and it is adept at camouflage, deception and preemptive accusation. It is also capable of speaking of the positive as negative and evil, and vice versa. It is extremely good at disguising itself. Even when it is obviously evil and reactionary, it still disguises itself as good and righteous, doing its utmost to trumpet its so-called greatness, glory, and rectitude. This is a usual tactic of the Chinese Communist Party. The CCP is most adept at the game of a thief crying “thief.” In the entire world, it is the CCP that is best at beguiling, deceiving, corrupting and toying with mankind; the CCP is the slaughterer of humanity. Only the Chinese Communist Party could define an orthodox church as a cult when in fact, the Chinese Communist Party is the real cult, the genuinely evil cult. It is a typical representative of all cults. The Chinese Communist Party is the bona fide Satanism in the last days, a typical evil enterprise, and the most sinister and insidious reactionary, terrorist organization in the whole world. This is a widely accepted fact, which is not at all mistaken. In addition, whether a religion or a church is a cult or not should be weighed by the majority, by all those who have faith, and people from all over the world based on universal values recognized by all nations. Only this is fair. It is rather absurd to decide which belief system is a cult simply by the communists’ atheist constitution; this is because the Communist Party itself is an atheist organization which fundamentally denies the existence of God. The CCP particularly does not know God and is resistant to God—it is an enemy of God and hence is not qualified to comment on anything regarding faith. It is particularly not entitled to assign any culpability to any religious body or church. In fact, based on atheism and its constitution, the Chinese Communist Party has designated all religious bodies and churches as cults, including Christian churches, all home churches and some other religious groups; it has also publicly defined the Bible as a cult literature. This is a widely recognized fact. Since taking power in mainland China, the CCP has used various brutal tactics to restrict, suppress and persecute people of faith and to deprive people of their freedom of belief. It exploits public opinion, politics, the law and other means to pressure the church, intimidate believers, and prohibit people from worshiping and following God. Instead, it wants everyone to worship it, obey it, continue to accept its rule, and serve it. It is so shameless and preposterous, it proclaims that people’s happiness is bestowed by the Communist Party and that the Communist Party is the “provider of bread and butter” for the Chinese people! Palpably, the Chinese Communist Party is a genuine evil party and a cult that is more fascist than fascism itself. In today’s world, the Chinese Communist Party is the evil conglomerate that resists God in the most insane, brutal and vicious manner. The ways it exploits, deceives and suppresses people are the most brutal, and it has massacred and ensnared the greatest number of human beings. It long ago incurred the wrath of God as well as the resentment of man. This is why it is a universally recognized fact that China has the largest number of people fleeing the country, with the most serious emigration exodus of people wanting to escape this infernal prison state. Thus this unlawful ruling party that has seized power by prevarication, fraud, guile, violence, and massacre simply is not qualified to comment on or condemn any religion or church as orthodox or a cult. The CCP’s constitution is not at all consistent with international human rights conventions. Although China is a signatory to some international conventions, that is merely its way of beguiling the people and the world—it has never acknowledged or accepted them, and it particularly does not comply with them. Therefore, the constitution of the Chinese Communist Party is not really law in its truest sense. It does not serve the people, but it is merely a tool for restraining and binding the people. The CCP itself does not follow its own law at all. It is safe to say that the law does not exist at all in authoritarian, communist countries. At one point or another, Chinese communist officials and police officers have openly stated that they themselves are the law and what they say is the law. Therefore, in the authoritarian state of the Communist Party, power trumps the law, resulting in this current state of lawlessness. Hence the Chinese people long ago stopped believing in any of the Communist Party’s nonsense, because everything it says is invariably fallacious and heretical; it all distorts the facts, turns black and white on its head, and makes no sense. It aims to deceive, paralyze, and toy with the people. Previous：Why does the religious world put so much effort into condemning and madly resist Almighty God and The Church of Almighty God?